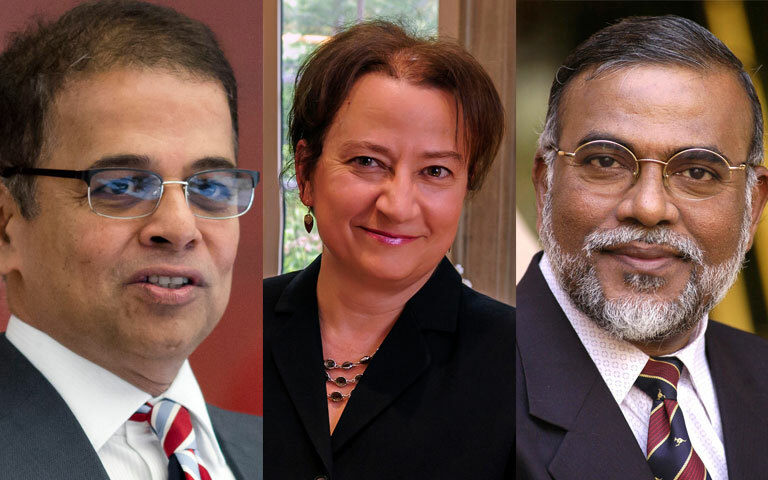 Indiana University Bloomington Provost and Executive Vice President Lauren Robel is traveling to India to enhance relationships with key university partners and alumni and announce an agreement with one of the country's most dynamic institutions, Ambedkar University Delhi. Robel's visit also will include meetings in Delhi at O.P. Jindal Global University, where IU already has a strong and productive partnership, and at Indian Institute of Technology Delhi, a national research university. She also will visit FLAME University, an emerging liberal arts institution near Pune. Her trip is a follow-up to her past activities as well as those of IU President Michael A. McRobbie. In November 2014, McRobbie dedicated the IU India Gateway office in Gurgaon, a suburb of New Delhi. The facility serves as the hub for the university's activities across the country. Robel will meet with FLAME University Vice Chancellor Devi Singh, who previously led Indian Institute of Management-Lucknow, which already has a successful agreement with the IU Kelley School of Business. In 2013, Robel welcomed Singh and a delegation of 14 high-level leaders at Indian universities and technical institutions for a week of leadership and institution building. She also will meet with Narendra Jadhav, an IU alumnus, economist, writer and educator who also serves in Rajya Sabha, the upper house of India's parliament. In 2011, McRobbie presented Jadhav with its Thomas Hart Benton Medallion, which is given to individuals who have achieved a level of distinction in public office or service and have exemplified the values of IU. "It is always an honor to represent Indiana University abroad," Robel said. "I am delighted to be returning to India, a dynamic country with wonderful university and industry partners. I look forward to renewing our relationships with some of India's pre-eminent universities." Ties between IU and the world's largest democracy are extensive. More than 1,100 Indian students are enrolled at IU campuses across Indiana. This figure represents a nearly 50 percent increase in the number of Indian students enrolled at IU over the past five years. More than 4,300 IU alumni are affiliated with India, who, along with the hundreds of scholars, dignitaries and students who have visited IU campuses, comprise IU’s ever-growing global community. India also is a leading destination for IU students pursuing an overseas study opportunity, with more than 100 students currently studying abroad in the country. The Madhusudan and Kiran C. Dhar India Studies Program, within the School of Global and International Studies at IU Bloomington, is one of a handful of U.S. centers for the study of Indian history, languages and cultures. On Oct. 17, Robel will sign an agreement of friendship and cooperation between IU and Ambedkar University Delhi. She also will sign a sub-agreement that calls for a joint research symposium in the first year, followed by undergraduate and graduate student exchanges and faculty and administrative exchanges. Robel noted that Ambedkar University complements IU's academic expertise and interests in South Asia. Among its innovating offerings are programs in social entrepreneurship, human ecology with an interdisciplinary emphasis and development studies. "Our new partnership with Ambedkar University offers exciting opportunities for our students, faculty and staff to deeply engage with Indian culture and the Indian educational system," she said. "We envision many innovative exchanges in the near future focused on our mutual commitments to social equality and social justice." Today, Robel held a series of meetings with Singh, other administrators and deans at FLAME University, which was established in Pune as an accredited private institution in 2014. Located on a 53-acre campus, it offers degrees in liberal education, business, communications, fine arts and performing arts, as well as an MBA degree. On Thursday, Robel will deliver a public lecture at O.P. Jindal Global University on the topic, "Liberal Arts in Global Environment." During a previous official visit to India in 2013, Robel gave the keynote address at a three-day international conference about the future of higher education there. IU has a formal agreement with O.P. Jindal that includes programs for student exchanges with its Maurer School of Law and general activities with its School of Public and Environmental Affairs. "I feel a strong affinity for O.P. Jindal, having first visited the university at the time of its founding," Robel said. "Their focus on the importance of liberal arts education in a globalized world is closely aligned with our own mission as a public university." On Friday, Robel will visit the U.S. embassy to India in Delhi and visit IIT Delhi, before attending an alumni reception that evening. Joining Robel on the trip will be M.A. "Venkat" Venkataramanan, IU Bloomington vice provost for finance and strategy; Michael Dodson, director of the Madhusudan and Kiran C. Dhar India Studies Program and academic director of the IU India Gateway office; Rita Koryan, IU assistant vice president of international affairs; Shalini Choubey, manager of the IU India Gateway office; Fred Perry, executive director for international advancement at IU Foundation; and Catherine Dyar, the provost's chief of staff.